Aspinal leather mini notebooks are individually handmade in our workshops by master craftsmen and women. Each leather mini notebook is handmade using only the finest premium vegetable tanned leather and traditional book binding skills handed down through generations. The internal pages of each leather journal is made using only the highest quality cotton and pulp mix and is available in off white cream with lined or plain pages. 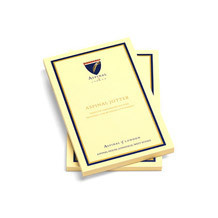 All Aspinal Leather Journals & Notebooks can be personalised with names, dates, events or holiday destinations.